It is common for arthritis (osteoarthritis) to affect your thumbs. Depending on how bad this is, this can make it hard to do everyday tasks such as open jars and doors, do crafts and hobbies, or work in the garden. It often gets worse over time. Osteoarthritis often happens in both thumbs, but one thumb is likely to be worse than the other. Older people are usually more affected than younger people. Your GP may suggest an X-ray to confirm that you have arthritis in your thumb, but this isn't always necessary. They may be able to diagnose arthritis based on your symptoms and what they can see. You will probably have to start prioritising the tasks that are most important to you, and minimise others if possible. Take lots of small breaks when doing anything that involves your thumb. Whenever you need to pinch or hold something between your thumb and index finger, watch the position of your thumb. It should make a circle with your index finger, not collapse into your index finger and across your palm. 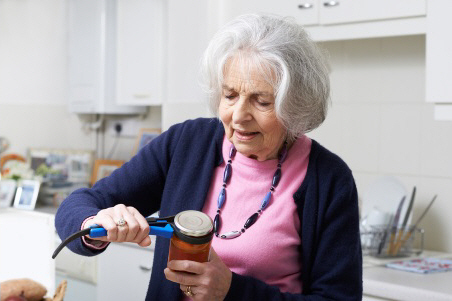 Tasks that involve long or strong pinching, such as opening jars, turning door knobs or keys, writing, or craft activities will often make your symptoms worse. Try to cut back on them, or change the way you do them if you can. If someone else is around, get them to do these things for you. If you can't avoid doing certain tasks, you might need to get special equipment to make them easier. If the pain of arthritis in your thumb interferes with your everyday life, your GP may prescribe you medicines to help. They may also suggest a steroid injection into your thumb joint, which can reduce pain and inflammation and make it easier to use your hand. A hand therapist will also be able to help, especially if your thumb is not too deformed by the arthritis. They can make splints to take the pressure off your thumb when you are using your hands – these can be rigid or soft, depending on what works best for you. Your hand therapist can also give you exercises to reduce the pain and inflammation, and increase the flexibility and stability of your thumb. This will make it easier for you to use your hands. An occupational therapist may be able to help you find different ways to do things and learn how to use any special equipment. If these treatments don't help, your GP may consider referring you to see an orthopaedic surgeon, who may suggest an operation. In this case, your GP is likely to send you for an X-ray, to find out how damaged your thumb joint is. If the pain and disability becomes too bad, you may need surgery, which is available through the public health system. There are different types of surgery for your thumb joint, depending on how damaged it is and what you want to be able to do. Your surgeon will talk about this with you. No matter which type of surgery you have, it should decrease your pain and make it easier to do your daily tasks. You may choose to pay to see a private orthopaedic surgeon and private hand therapist. After the operation, it's important to keep your hand raised (elevated) as much as possible for the first two to five days. This helps to reduce swelling and pain. Try to keep your hand higher than your heart – it can help to put pillows and blankets under your arm when you go to bed. Your hand and wrist will be in a cast for six weeks, so you won't be able to do many everyday tasks. It's important to exercise your shoulder several times a day by raising your arm above your head and also reaching behind your back. This will help to stop your shoulder and elbow from becoming stiff. Your surgeon will let you know when your cast will come off, and will also check how well your thumb and hand are moving. They will also refer you to a hand therapist, who can splint your thumb if necessary and give you exercises that will help to strengthen your thumb, increase your movement, and minimise the scar. The hand therapist can also help you return to everyday tasks as you gradually get better. It is likely to be three to six months before you will be comfortable fully using your thumb again. Canterbury Community HealthPathways - First Carpometacarpal Joint (CMCJ) Osteoarthritis, retrieved December 2016.